The gap between black and white student debt is large and growing, according to a new paper from the Center for Demography and Ecology at the University of Wisconsin-Madison. 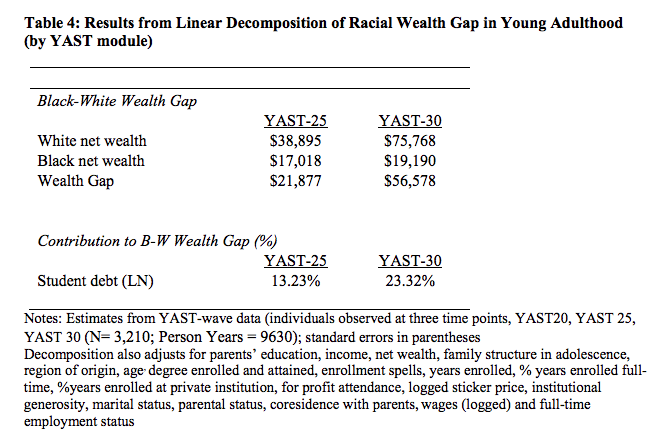 First, supporting prior research, we find that at baseline (intercept) race is significantly associated with debt levels, such that black youth report 83.3% [e.606] more debt than their white counterparts, after adjusting for family background and postsecondary characteristics. Second, we find that these racial differences in debt at baseline grow over time. After adjusting for all intercept controls (Model 1), the black/white disparity in debt grows by about 6.8% annually. That is, black youth start their young adult careers with more debt than whites, and this disparity grows over time. To demonstrate the magnitude of this growing disparity in debt: While blacks hold 83.3% more debt at baseline than 17 whites, fifteen years later we would predict that this disparity to have increased to approximately 185.3%. In other words, racial disparities in debt are large, and more than double across the course of young adulthood. Black students are more likely to have private loans, which carry high and variable interest rates, have high fees for deferment and forbearance, and offer few protections for borrowers. Black students are disproportionately steered toward predatory, high interest loans that are difficult to repay. Black young adults are often funneled toward or have access limited to predatory for-profit institutions and underfunded schools, which are associated with high levels of debt accumulation. These institutions also offer fewer labor market benefits and have high drop-out rates, increasing the risk of loan default and and making the debt more difficult to repay. Add to that the disparities in recovery from economic turmoil and the wealth and debt gaps continue to grow wider, the paper argues. Prior to the recession, median white household net wealth was around eight times greater than the median black household. After the recession, median white net wealth was thirteen times that of blacks (Kochnar and Fry 2014), which can be partly attributed to the disproportionate impact of the great recession on black families coupled with the uneven economic recovery that benefited whites more than blacks (Pfeffer, Danzinger and Schoeni 2013). Racial disparities in debt have also increased in recent decades, particularly among those with college educations. Using repeated cross-sectional data, Seamster and Charron Chénier (2017) show that the percent of black households with student debt, and the average debt among black households have increased relative to whites in the past two decades, and these increases cannot be explained by changes in college attendance by race. The correlation between these two trends have led some scholars to suggest that debt may be reproducing or exacerbating racial inequalities in wealth (Seamster and Charron-Chénier 2017). Read the full paper, with tables and methodology, here. This excellent piece on the racial disparity on student debt – which includes an interview with one of the authors of the paper – is also well worth a read.